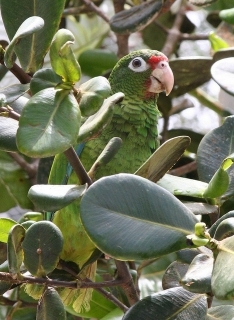 Hurricanes are a major threat to the Puerto Rican Amazon and many other Central American parrot species. A.v. vittata: Both adults mostly green, medium sized parrots; yellow on underparts, the feathers scalloped with soft black; red lores and frontal band; dark blue primary coverts and primary feathers; tail green with red at base. Bill yellow/horn in colour. Eye ring white. Eye brown. A.v. graciliceps (extinct): Both adults as in vittata but smaller in size and with smaller, more slender feet. As in adults but with pale yellow bill with grey at base of upper mandible. Large range of whistles, squawks, horn like sounds; complex repertoire which may be individual to each bird. Breeding facilities at El Yunque and Rio Abajo, Puerto Rico. Variety of wild fruits and other wild vegetation. In 2018 estimates are about 600, including the breeding programme. Mainly habitat loss; also hunting, wild bird trade and hurricanes. Remaining habitat protected within Caribbean National Forest. Puerto Rico and formerly neighbouring islands of Mona and Culebra; possibly Vieques and St. Thomas. Formerly found in all vegetation types from mangrove to montane forest with the exception of dry forest in south of Puerto Rico. Reminant population found in moist montane forest between 200-600m (656-1968 ft). Birds feed on Ficus and jagua (Genipa americana) fruits, and the nuts of Chrysobalanus icaco. Also takes Dacryodes and allied species' seeds. In the Luquillo rainforest birds were recorded taking fruits, seeds, flowers and leaves from up to 60 species of plant. Found generally in pairs. Aggressively territorial when breeding. Formerly found in large flocks. 2 to 4, 35.5 x 28.5mm (1.4 x 1.1 in).